Cleo is a pretty, bright seven-year-old. She loves painting, crafts and pizza. What she does not like: the lengthy inhalation procedures, at least twice a day. The process lasts about two hours each time, trampoline jumping and coughing included. 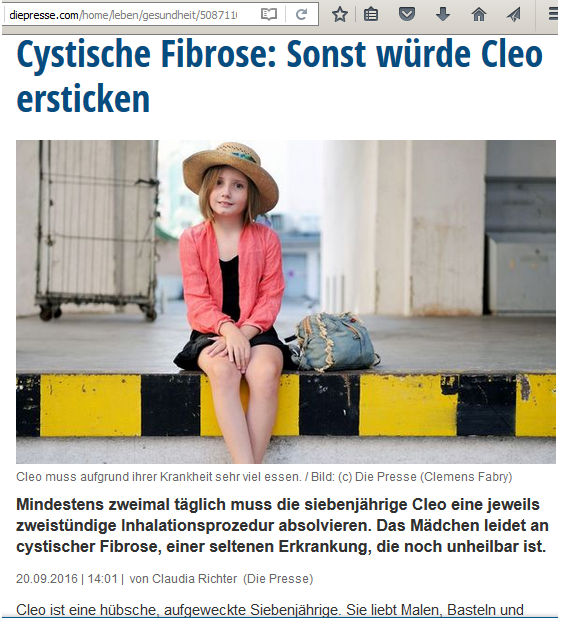 Cleo has Cystic Fibrosis (CF), the most common of the so-called rare diseases and the most common hereditary disease in our population. In Austria, one out of 3,500 people is affected. Every year, 25 to 30 babies are born with CF, and currently there are around 800 Austrians, half of them adults. CF, also known as Mucoviscidosis, is a congenital metabolic disease. The salt and water balance is disturbed, it forms thick mucus, which can lead to constipation in the organs. Thick mucus clogs the respiratory tract, in many cases also puts the pancreas out of action, can clog bile ducts, fallopian tubes or the vas deferens, damage the liver. “Without daily therapy, that we started just a few days after Cleo’s birth, my daughter would suffocate and starve,” says her mother, Eugenie Hodkevitch. The therapy of the lung should improve the impaired breathing. Twice a day – in the morning and in the evening – the girl has to inhale as explained, perform special breathing exercises, jump trampoline to loosen the mucus and make it easier to cough. Against the starvation, the seven-year-old receives artificial enzymes in tablet form. “I have to take this with every meal,” says the little patient without any hint of self-pity. Cleo also suffers from 100% pancreatic insufficiency. And for your organism to get the most important nutrients, she not only has to take supplements, but also to eat a great lot. “Today, for breakfast, I ate half a porridge with butter, then half a roll with very, very thick butter on it and seven pot pies. To go with it, I drank cocoa with a lot of whipped cream,” Cleo says. She is very slim, “she looks good for a CF child,” adds father Boris Hodkevitch. He and his wife Eugenie – both 44, both independent architects – are carriers of the defective gene: a mutation on chromosome seven leads to CF. But only if both parents pass on the carrier gene to their offspring. What can happen, but not necessarily – the other two children of Eugenie and Boris Hodkevitch are healthy. Cleo looks healthy, because you can see the disease from the outside. “You do not see that she has to undergo the inhaling procedure at least twice a day,” says the mother. Every little cold can return twice or three times, four or even five times. And you do not see either that the lung function is gradually getting worse despite conscientious therapy. Only in ultrasound, you can see the already altered liver tissue. Nor can you see that Cleo – in contrast to her siblings – is not allowed to the swimming pool, nor in the vicinity of a fountain. That she is not allowed to play with a spray gun and has to avoid wet leaves or a puddle. “That does bother me actually, that I can not climb in puddles,” says the girl. But old water is dangerous for CF patients. Because the bacteria contained therein, pseudomonads, can cause serious and permanent infections for people with Cystic Fibrosis. “Our life is made up of many, many ‘No’,” says Cleo’s mother. Every three months, her daughter has to undergo pseudomonas control and once a year a routine bronchoscopy at the Vienna General Hospital. The clinic for Cystic Fibrosis there is led by Sabine Renner: “Frequent infections and inflammations are often the result of the viscous mucus and lead to increased mucus. This vicious circle often causes organ destruction,” says the doctor. However, in the pipeline are already medications that could affect the genetic defect itself and possibly one day cure the disease. “That’s what gives us all courage and hope,” says Cleo’s mother. Even though she knows Cleoas a CF patient runs an increased risk of depression, diabetes and osteoporosis at an early age because of her illness. “But with a lot of discipline, we shall be able to overcome these obstacles“, Cleo’s parents are sure. And this also because the seven-year-old herself is a true fighter. And pretty cool on top of that.